contributes to maintenance of normal brain function (beneficial effect is obtained with a daily intake of 250 mg of DHA). DHA contributes to the maintenance of normal vision (beneficial effect is obtained with a daily intake of 250 mg of DHA). 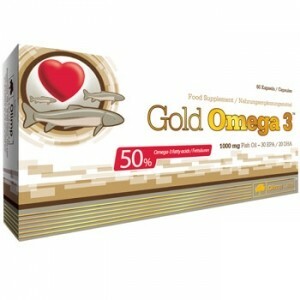 Ingredients: High-quality cold sea-water fish oil, rich in 65% of Eicosapentanoic (EPA), Docosahexanoic acid (DHA) and other Omega-3 fatty acids, which represent a highly-valued supplementation of essential ingredients of the food pattern. Swallow one capsule daily. The product is recommended to adults as a food supplement. Do not exceed the recommended daily dose. Food supplements should not be used as a substitute for a varied and balanced diet. A varied and balanced diet and a healthy lifestyle are recommended. Keep out of reach of children.